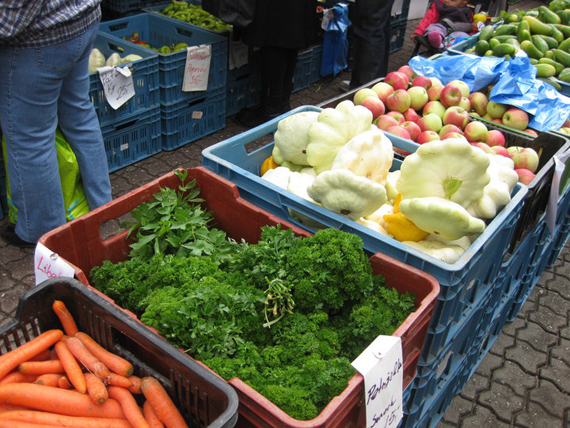 After a winter hiatus Prague’s Farmers Markets are open for business. This is where you go for locally grown vegetables, fruits, cheese, yoghurts, meats, bread, pastries, wines, chocolates etc. etc. 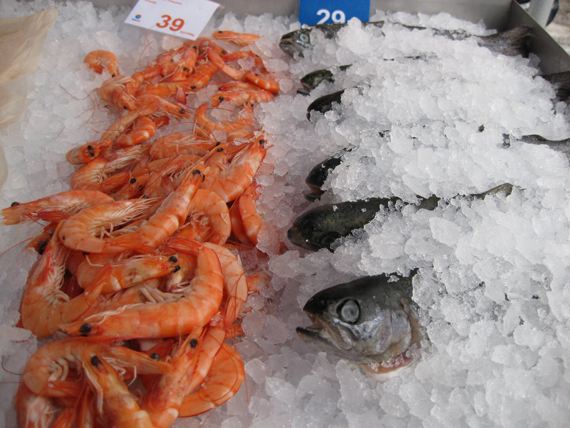 Support local and minimise your dependence on hypermarkets, the experience is enjoyable and very community orientated. Thanks to Emily for alerting me to the markets at Na Kulaťáku in Dejvice, Prague 6 which run every Saturday from 8 till 2pm. We really appreciate reader’s feedback as we find it a challenge covering all areas! 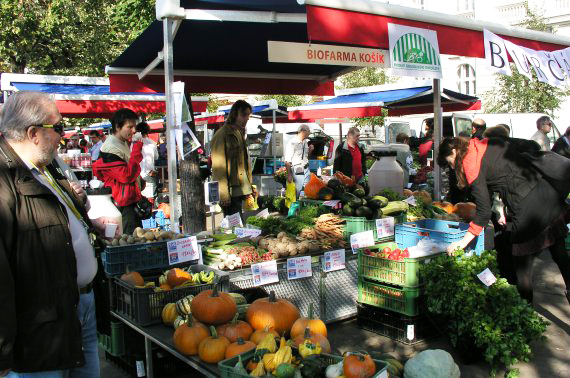 Also, there is now a regular farmers market in Andel near the metro (Prague 5) and also IP Pavlova, Prague 2. When I head out to Tesco in my car I never bump into or meet friends or associates, instead I’m often faced with rude, tired checkout operators and then have to battle Prague’s notorious traffic. To contrast this experience there is nothing nicer than walking with Ari in the stroller and shopping in the local square. 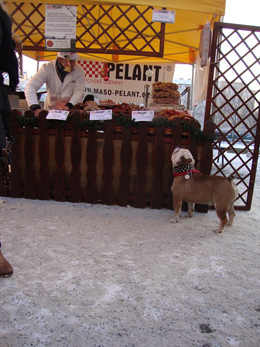 Here I will often run into friends, catch up and compare offerings on the various stalls. Produce is seasonal so when mushroom season is in full bloom you get the most amazing selection to choose from. 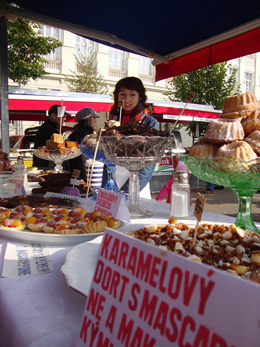 Produce varies at each market, for instance Lanka Cakes often sell out of Kubáň in Vršovice, and in Jiřák there is a fishmonger, turkey producer, hungarian specialty stand and you can even pick up yummy homemade Halusky (Slovak Speciality). Our family usually order a box of mixed vegetables which you order the week before. It’s always a nice present pick up, you never know what you will receive from the farm but a usual order will include potatoes, carrots, beets, lettuce, tomatoes, eggs and honey. In my youth I was a part-time farm girl and when washing these vegetables clean of soil I have strong memories of being ordered out in the dark to pull out our home-grown produce for dinner. 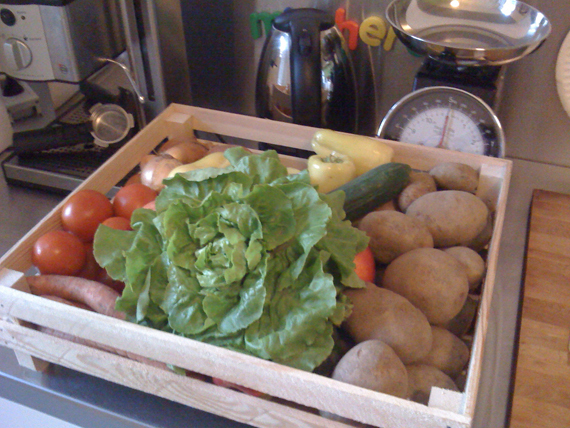 It now seems such a luxury but thankfully its as easy as ordering a well-priced box of goodies from the local market. These particular farmers speak English and travel between the markets so you should have no trouble finding them and placing an order. ADDRESSES: Kubáň, Kubánské náměstí, Prague 10 (Všovice); Jiřák, Náměstí Jiřího z Poděbrad, Prague 3; Náplavka, Palackého náměstí, Prague 2; Dvořákovo Nábřeží, Prague 1; Na Kulaťáku, Vítězné námestí, Prague 6 (Dejvice). DIRECTIONS: Kubáň: Trams 6, 7, 19, 22 and 24 to Kubánské Náměstí stop, Metro: A line to Náměstí Míru and then 8 stops on tram 22 to Kubánské Náměstí or A line to Strašnická and then 2 stops on tram 7 to Kubánské Náměstí. Jiřák: Tram 11 to Náměstí Jiřího z Poděbrad stop or trams 10 and 16 to Vinohradská Vodárna stop, Metro: A line to Jiřího z Poděbrad. Náplavku: Trams 3, 4, 7, 10, 14, 16, 17 and 21 to Palackého Náměstí stop, Metro: B line to Karlovo náměstí, exit at Palackého náměstí and head left and down to the river bank to Náplavku markets. Dvořákovo Nábřeží: Tram 17 to Právnická fakulta stop, Metro: A line to Staroměstská. Na Kulaťáku: Trams 2, 8, 20, 26 to Vítězné námesti, Metro: A line to Dejvice.